My mother-in-law loves purple yam (also known as Ube) so I decided to make a popular asian dessert which features it prominently. Bubor Cha Cha is a porridge dessert with pieces of yam or colored dough in a sweetened broth. Sometimes it’s made with tapioca which is how I like it. I also like it creamy and with lots of coconut milk! Purple yams are in season and started showing up in our markets. The flesh is a shockingly deep, rich purple color as you’ll see below. Overall, it’s fairly starchy and becomes almost creamy when cooked. The mild sweetness of the yam is popular in Southeast Asian desserts. While it’s not common in Western cooking to eat yams for dessert, or to even eat sweet soups for dessert, this dish may just open your horizons. It can be served either warm or cold, my preference is for the latter. The dessert has a light, creamy coconut flavor with the tapioca and yam texture mixed throughout. The yam offers a tender, mild sweetness to the porridge. 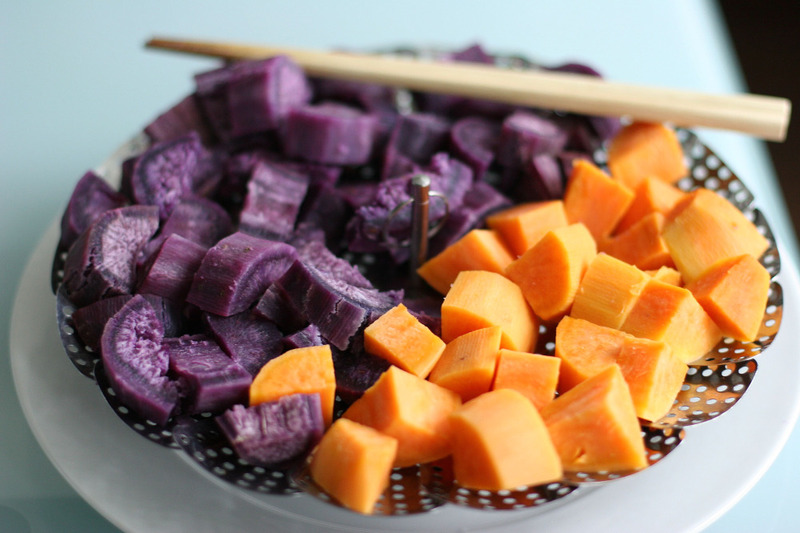 Using a steaming tray in a large pot, separately steam the purple yam and sweet potato until tender. I find that the purple yam cooks more quickly. Set aside and allow to cool while preparing the porridge. In a small pot, combine water and sugar. Bring to a boil, then stir in coconut milk. Heat the mixture until it almost reaches a boil once again and remove from heat. Set aside and allow to cool. In a small bowl of cold water, add the tapioca and allow to sit for 5-10 minutes. Drain and add tapioca to a pot of water, then bring to a boil. Cook until the tapioca pearls become translucent then remove from heat and strain in a fine mesh strainer. Rinse with cold water so the pearls don’t stick together. 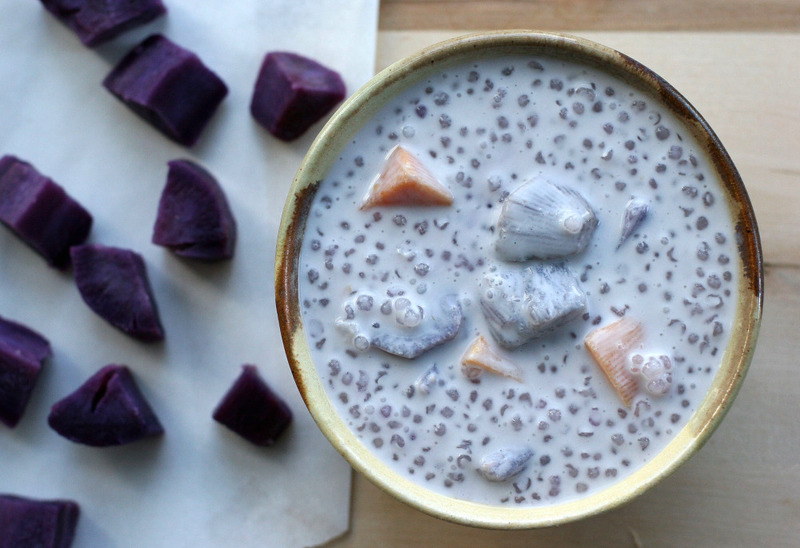 In a large container, add the steamed yams, coconut broth, and tapioca. Stir to combine and refrigerate for 1-2 hours. It will thicken slightly as it cools and the tapioca absorb some of the liquid. It will keep in the refrigerator for 2-3 days. If you find that you’d prefer it not as thick, simply add water to reach the desired consistency. I should note that my recipe is not entirely traditional as I did not use pandan leaves to flavor the coconut milk. Unfortunately, I wasn’t able to locate them. However, the dessert was delicious even without the pandan! Wow this is stunning! Sounds beautiful. I had something very similar to this in a Philippino restaurant. I loved it! Bowl of Mush: Thank you! Charlotte: It was probably the same thing – it’s a common dessert in the Philippines. A Filipino friend noted that they like the dessert with the dough dumplings, jackfruit, and a type of plantain/banana as well. Yum, this dessert has all my favorite ingredients so I’m sure I’d enjoy it. Such a cool looking dessert! Yum! My mom use to make a different variation of this. This is gorgeous! Beautiful photos — love the colors! I would have never thought that the ingredients make such a desert. Very interesting. i love those vibrant purple yams! :) i usually have it with ginger soup, so i must give this coconut version a try soon!